Protestors demonstrated against President-elect Trump. A Harvard Law professor, former governor William F. Weld, and Al Gore’s onetime attorney are making a long-shot bid to change the Electoral College system, arguing that it encourages presidential candidates to devote all their time to a handful of swing states and ignore the vast majority of the country. The high-powered group is suing two blue states, Massachusetts and California, and two red states, Texas and South Carolina, arguing that the winner-take-all system that they and 44 other states use to allocate electors to the Electoral College effectively disenfranchises millions of voters who back the losing candidates. In 2016, for example, more than 1 million Massachusetts voters cast ballots for Donald Trump, but that translated into zero Electoral College votes because Massachusetts’ winner-take-all system required all 11 of the state’s electoral votes to go to Hillary Clinton. Similarly in Texas, nearly 4 million voters cast ballots for Clinton, but all 38 of the state’s Electoral College votes went to Trump. The group contends that the winner-take-all system violates the “one person, one vote” principle because voters who back losing candidates in the general election in November have their votes “discarded when it really counts in mid-December,” and the Electoral College picks the president. 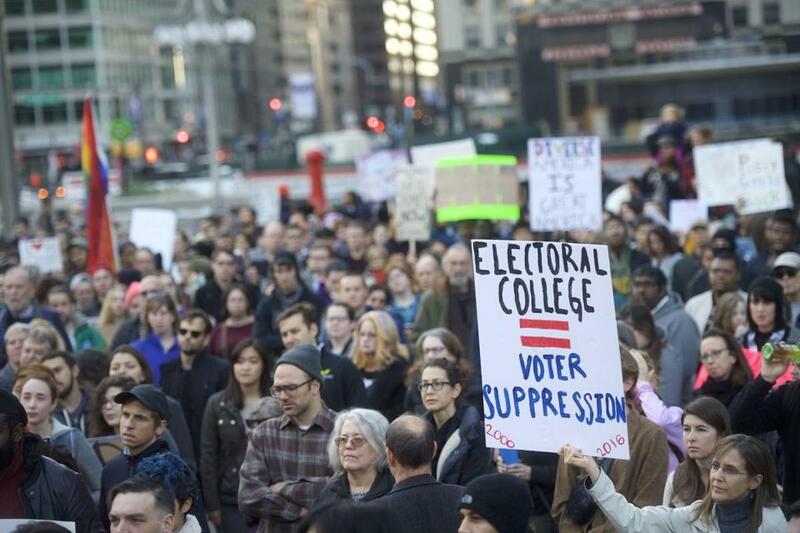 Frustration with the Electoral College has increased, particularly on the left, since Clinton became the second Democratic presidential nominee after Gore to win the popular vote but lose the presidency in the Electoral College in the last two decades. The lawsuits were orchestrated by Lawrence Lessig, a Harvard Law professor and longtime critic of the Electoral College, corporate money in politics, and gerrymandering, who briefly ran for the Democratic presidential nomination in 2015. He hopes to get the case to the Supreme Court before the 2020 presidential election. While other critics have called for the outright elimination of the Electoral College, which would require a constitutional amendment, the legal challenge targets state laws that require a winner-take-all system in choosing electors. David Boies, who represented Vice President Gore in Bush v. Gore, the 2000 Supreme Court case that tipped the presidency to George W. Bush, is the lead attorney in the case, and was in federal court in Boston for preliminary arguments on Thursday. Weld, the former Republican governor and 2016 Libertarian nominee for vice president, is one of three plaintiffs in the Massachusetts case. The other two are Republicans — a Harvard student and a former Weld administration official. The group argues that if states were to pick electors proportionally, based on the results in each state, it would encourage candidates to campaign nationwide. Trump, for example, would have had an incentive to campaign in Massachusetts, in hopes of picking up a few Electoral College votes. And Clinton would have had a reason to campaign in Texas — perhaps in Austin or San Antonio — in hopes of winning some of that state’s Electoral College votes. “They should pay attention to everyone in the country, not just swing-state voters,” said Jason Harrow, an attorney for Equal Citizens, a nonprofit founded by Lessig that is coordinating the legal campaign. Saris was openly skeptical of the effort, saying in court that she would be reluctant to order the Legislature to fix problems with the Electoral College unless there was a “plain violation” of voters’ constitutional rights. “It’s a steep hill,” Saris said. Attorney General Maura Healey is fighting the lawsuit on behalf of Governor Charlie Baker and Secretary of State William F. Galvin, who have been named as defendants. Healey’s office argues that invalidating Massachusetts’ winner-take-all system would upend a practice that dates back to the early days of the republic, and has been upheld by every court that has considered it. Assistant Attorney General Amy Spector told Saris that the winner-take-all system does not violate the First Amendment right to free association or the 14th Amendment right to equal protection because it treats all candidates the same, regardless of party. If the plaintiffs are concerned about the Electoral College, they should take their case to Beacon Hill, not federal court, Spector added. Galvin said in an interview Thursday that he supports abolishing the Electoral College, but strongly opposes the lawsuit because he worries that allocating electors based on a percentage of the vote in each state would lead to disputes and confusion. Galvin said he would support what he called a more rational system that would allocate electors based on the winners in each congressional district, as is the practice in Maine and Nebraska. Baker’s office declined to comment, saying it does not generally speak about pending litigation.